Before we go any further, Savannah Cats do not need ‘special’ vaccines. There is an old-wives-tale in the Savannah cat community that Savannah cats should never have Modified Live Virus (MLV) vaccines. This is simply not true. Many of us even give MLV vaccines to our serval cats. That being said, let’s discuss what a vaccination is and why a responsible breeder pays so much attention to vaccinating. Various laboratories prepare vaccines. The labs take very small amounts of the virus or bacteria it will protect against and modify it to form vaccines. They then distribute it in small, sterile bottles. These are for sale to vets and breeders to administer to cats and kittens. Thie vaccines increase immunity in our cats, from a specific disease or virus. The two types of vaccines, killed and MLV, work in different ways. There are no general laws, except for rabies, that says a cat/kitten must have a periodic vaccine. Even now some vaccine manufacturers are making a three-year vaccine. More people are beginning to realize that following the practice of a yearly vaccine that our veterinarians recommend is over-vaccinating and we must weigh the benefits and risks. There are studies now where older cats 14+ years have had titer* tests run and have antibodies from their original kitten vaccines. Many of the killed vaccines contain adjuvants. Adjuvants, defined by Wikipedia is an immunological agent that modifies the effect of other agents. In terms we can all understand: adjuvants are added to vaccines specifically to cause inflammation at the injection site. This lets the immune system sense its presence and stimulate a response. 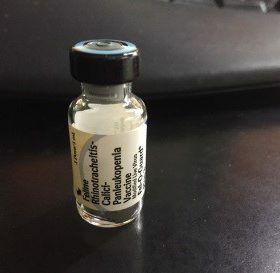 Adjuvants are the main cause of injection site sarcomas, although other things like Convenia, a long-term antibiotic and Droncit wormer and Program, a topical flea medication may also cause sarcomas. Sarcomas are no laughing matter. They are tumors that are very aggressive, malignant and fast growing. The FeLV vaccine often skipped because of its reputation for injection site sarcomas. This leads many breeders to recommend not using the FeLV vaccines on indoor cats. The good news….. Now the Merial lab has released a 3 year FeLV, non-adjuvanted vaccine and a 3-year non-adjuvanted rabies under the name of Purevax. The FeLV is given to kittens twice, three weeks apart and is not needed again for three years. The rabies is administered one year and again the second year and at that point is good for three years. Please talk to your breeder and your veterinarian about these vaccines. Chlamydia vaccines are not listed in with what kittens should have. Young kittens seem to have the most side-effects from the Chlamydia in the 4-way vaccines because it is a live virus. Many breeders recommend waiting until the rabies booster at one-year to give the Chlamydia vaccine, if at all. Kittens most times will lose their appetite, will sneeze for a week or longer and will have swollen and runny eyes from this vaccine. Rabies, preferably the first dose of the 3-year Purevax rabies. Given at 12-16 weeks old. FeLV ONLY if it is the 3-year Purevax. Some breeders do not vaccinate for this yet. Please feel free to print this article and talk this over with your veterinarian.